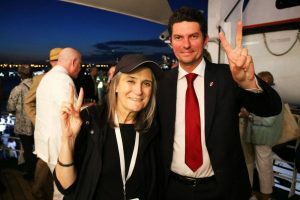 Peace Boat’s 98th Global Voyage docked at the port of New York City on the morning of July 12, coinciding with the United Nations High-level Political Forum on Sustainable Development (HLPF). The ship was host that evening to a special side event as part of the HLPF – the inaugural Partnership Expo. The HLPF, which convenes annually, was mandated by the UN in 2012 for the purpose of assessing global progress on the Sustainable Development Goals (SDGs). 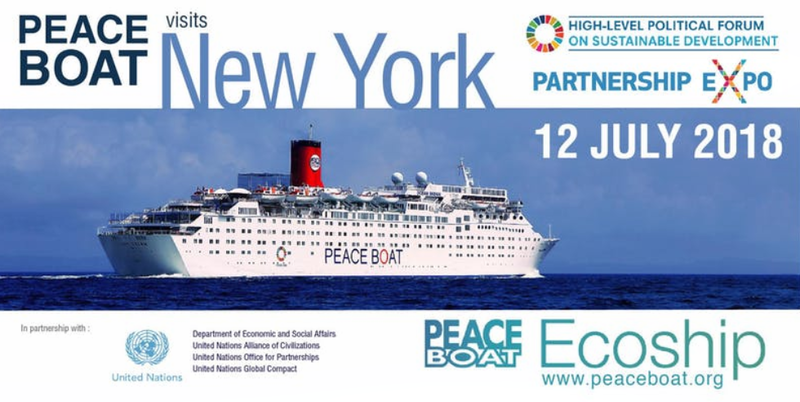 This marks the first occasion that Peace Boat provided a venue for an event of the HLPF, highlighting the importance of forming meaningful partnerships between the United Nations, the diplomatic community, the private sector and civil society, working towards a more peaceful and sustainable world. Attendees at Peace Boat’s Partnership Expo of the United Nations High-level Political Event pose for a photo. 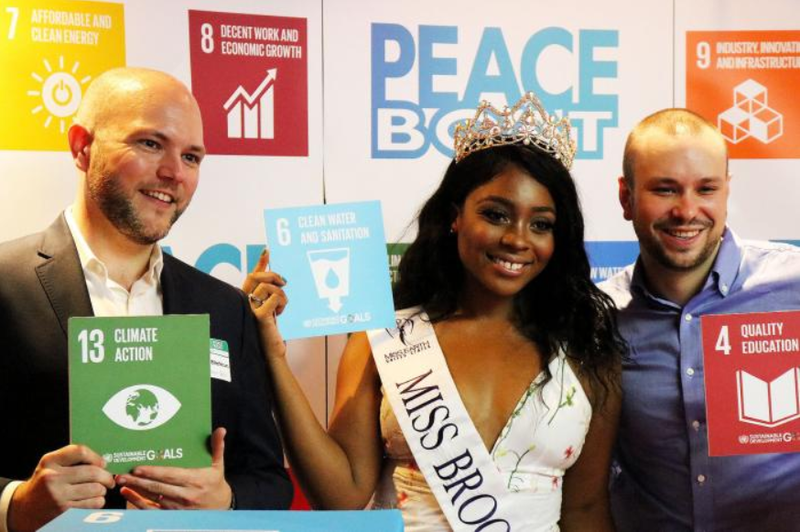 As an NGO holding special consultative status with ECOSOC of the United Nations, Peace Boat had the honor of collaborating with several United Nations agencies – namely UN DESA, the UN Office for Partnerships (UNOP), the UN Alliance of Civilisations (UNAOC) and the UN Global Compact to host the Partnership Expo. The evening began with effusive introductions by Peace Boat’s founder and director Yoshioka Tatsuya, emphasising Peace Boat’s commitment to the SDGs. Peace Boat is the only ship in the world to carry the SDGs logo on its hull. Long-term Peace Boat supporter Ms Cora Weiss spoke next, highlighting the importance of inclusivity and peace in moving forward for a sustainable world. 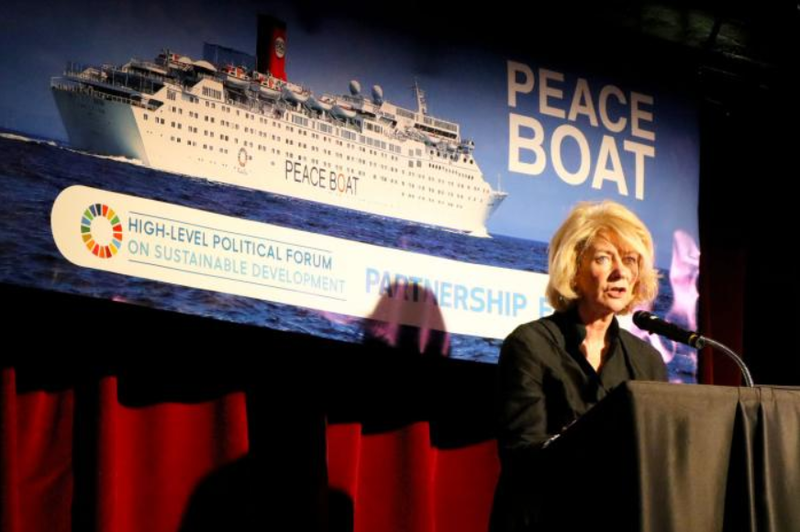 Ms Alison Smale, the United Nations Under-Secretary-General for Global Communication, speaks at Peace Boat’s Partnership Expo on behalf of UN Secretary-General Antonio Guterres. Following the opening, the audience was then treated to keynote speeches by UN officials including ECOSOC President Her Excellency Ms Marie Chatadova, and Ms Alison Smale, the Under-Secretary-General for Global Communication who attended on behalf of UN Secretary-General Mr Antonio Guterres. Ms Smale shared with participants the call to action that “there is no one partnership, or one project, or one event that can do it all. It is your collective work that forms a critical piece of a larger puzzle. Achieving the Sustainable Development Goals is not an option, it is an imperative for a safe and secure future of prosperity, opportunity and human rights for all. It is within our grasp.” Other speakers in this session also echoed this message, including High Representative for UNAOC H.E. Mr Nassir Abdulaziz Al-Nasser, Executive Director of UNOP Mr Robert Skinner, and Mr Dan Thomas on behalf of the UN Global Compact. 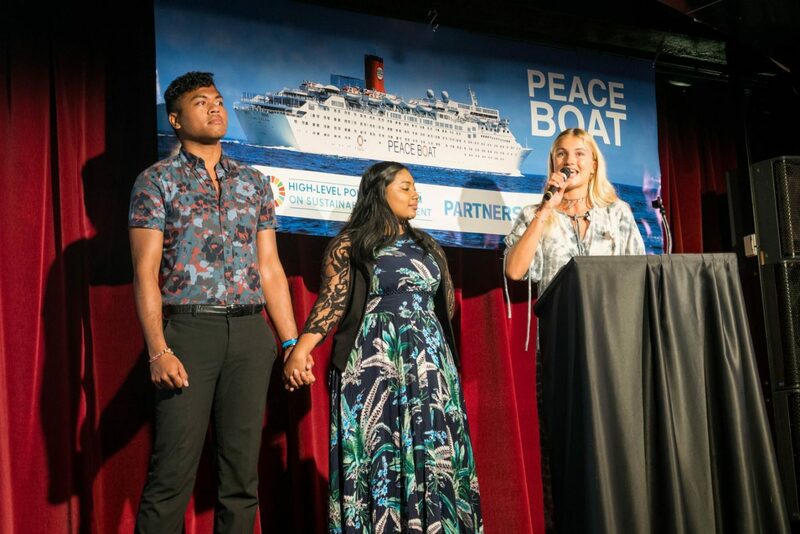 Three of Peace Boat’s Ocean and Climate Youth Ambassadors (from left to right: Manzel Ngirmeriil of Palau, Eve Isambourg of Mauritius and Genevieve Jiva of Fiji) present at the Partnership Expo. In the next special session on Oceans, Climate and Sustainability, Peace Boat was honoured to first hear words from the UNSG’s Special Envoy for the Ocean, H.E. Mr Peter Thomson. 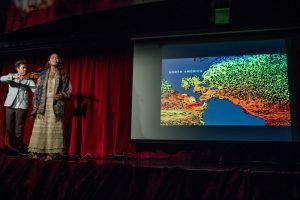 Following were featured talks by experts from the sciences, such as former NASA astronaut Col. Ron Garan who spoke about the life-changing experience of viewing the Earth from space. Viewed from space, there’s no question that our Earth is a single entity, and that the political divides we impose on it exist only in our minds. Though Dr Sylvia Earle, one of the world’s leading marine biologists and a National Geographic explorer-in-residence since 1998, was unable to attend the event, she sent a video message in which she commended Peace Boat for fighting what she holds as the biggest threat to the ocean: ignorance about why it’s important to take care of it. 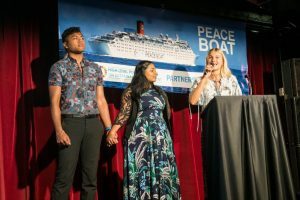 Peace Boat’s own Ocean and Climate and Youth Ambassadors were also able to present about their passion for the ocean, the lessons they have learned while travelling onboard Peace Boat, and their commitment to building a more sustainable world. Bella Gaia, one of the artistic acts featured at Peace Boat’s Partnership Expo, performs on stage. The Partnership Expo also paid homage to the importance of artistic and creative work in creating a more peaceful world. The audience was treated to a live performance by violinist Andrei Matorin, who sang, played the violin, and remixed his song live all in tandem as he performed. The Expo also featured a multimedia performance by Bella Gaia, led by Kenji Williams, that aims to convey the same message as Col. Garan about the holistic beauty of the Earth, using the mediums of music and video. 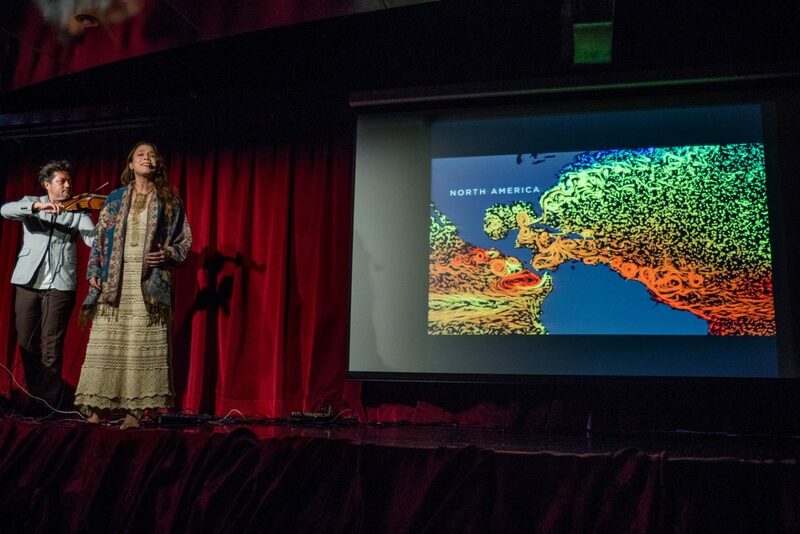 The members of Bella Gaia, which means “Beautiful Earth”, sang and played violin against a projection of images of the Earth and its geography. Amy Goodman of Democracy Now and Scott Ludlam, former Australian senator and guest educator on the 98th Global Voyage, enjoy time on the deck of the Ocean Dream. After the plenary presentations, attendees of the Partnership Expo ventured onto the deck of the Ocean Dream docked on the Hudson River to hear more live music from Andrei Matorin, and enjoy live painting by Dragon76 against the sunset behind the skyline of New York City. Guests were also able to view works by designers affiliated with the “Conscious Fashion Campaign”, a movement led by Kerry Bannigan aiming to produce fashion through sustainable and cruelty-free supply chains. The evening provided an opportunity for participants of the HLPF to gather outside the United Nations with representatives of Permanent Missions and the diplomatic community, Peace Boat partners and youth to network and discuss their respective initiatives for sustainability and peace, and reinvigorate their enthusiasm for together creating a better world.